Pioneer HDJ-1500 Professional DJ Headphone (Black) DJParts - All Variety of Parts that DJ Needs. The high-quality components incorporated into the HDJ-1500 headphones deliver perfectly balanced sound across the entire frequency spectrum. The combination of large 50mm drivers, copper-clad aluminum wire (CCAW) voice coils, rare-earth magnets and 38μm-thick diaphragms, significantly improve control of the drivers and produce better bass response. Users will hear pronounced vocals, hard hitting kick drums and snappy snare drums that make matching tempos between tracks effortless. The HDJ-1500 exemplifies the look and feel of pro-style headphones designed with large over-the-ears cups that not only look sleek but also contribute to their excellent performance. The model incorporates ultra-comfortable narrow low-resilience urethane memory foam ear pads to create a tight seal around the ears and significantly reduce external sounds. The urethane memory pads are also finished in durable leather for great feel and extended comfort. For additional convenience and DJ preference, the included ear pads can also be replaced with Pioneer’s optional HDJ-EP01s open-cup protein leather ear pads which sit around the ears. The HDJ-1500 features a moving headband and hinges composed of rugged yet lightweight magnesium alloy to withstand the rigors of extended professional use. Each earpiece swivels up to 90 degrees and can be flipped around 180 degrees for one ear listening. Furthermore, the included single-sided cable is detachable and can easily be replaced if damaged. 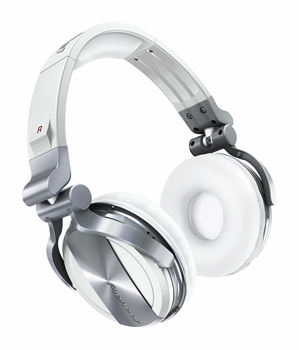 The headphones also include a compact carrying pouch for protection and convenience. For DJs who want extra headphone protection, Pioneer offers the optional HDJ-HC01 lightweight carrying case.